This artisanal pasta kit makes it really easy to create this popular, traditional dish at home and makes a lovely present too. 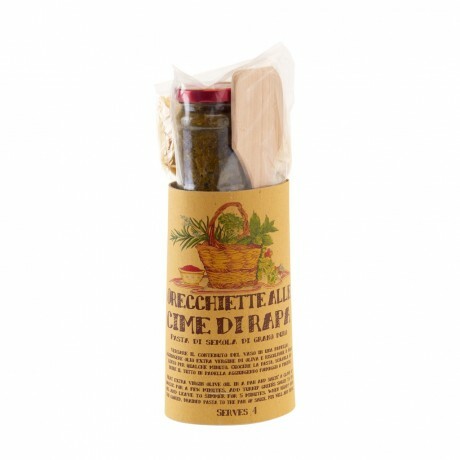 Each kit contains orecchiette ('little ears') pasta, a jar of turnip green sauce (also known as 'broccoli rabe' sauce) and a handy wooden spoon. An easy recipe is also included - just add a clove of garlic and some extra virgin olive oil. Pasta: Durum wheat semolina, water. Sauce: Turnip greens, extra virgin olive oil, sunflower seed oil, anchovies, chilli pepper, white wine vinegar, salt.